Marshall Aerospace and Defence Group has delivered the first Royal Bahraini Air Force C-130J aircraft. The Bahrain Defence Force recently bought two Royal Air Force C-130J aircraft from the UK Ministry of Defence and contracted Marshall Aerospace and Defence Group to carry out depth maintenance, ensure entry into service and provide elements of an initial operational capability set-up. After completing a depth maintenance inspection in Cambridge, which included some minor modifications and a full aircraft repaint, #702 was delivered to the customer. It wa anticipated that the aircraft could attend the prestigious Bahrain Air Show today. 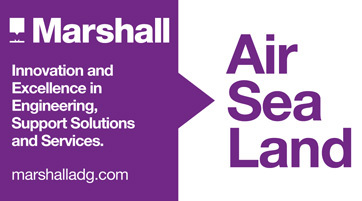 Duncan Eldridge, managing director of military aerospace at Marshall Aerospace and Defence Group said: “Our knowledge, skills and experience gained over 50 years on the C-130 platform enabled us to support the Bahrain Defence Force and the Royal Bahraini Air Force with their new aircraft. Matthew Harvey, international sales director Military Aerospace for Marshall Aerospace and Defence Group added: “Delivery of this aircraft sees the first Government to Government transfer of a C-130J and the Kingdom of Bahrain enter the C-130 community as a new operator.